My 29th birthday was yesterday (I had a lovely spa, house hunting, & food-filled day, if you were wondering) and we’re now into February. One month in 2016 down already! Geez, crazy. Every year, when my birthday comes around, I always know the following week is the big Game Day. It’s like I associate my birthday every year with the big game since it pretty much flows right into it. I remember one year my birthday fell on the big Game Day but ever since then, I don’t think it’s fallen on that day. I like that though. 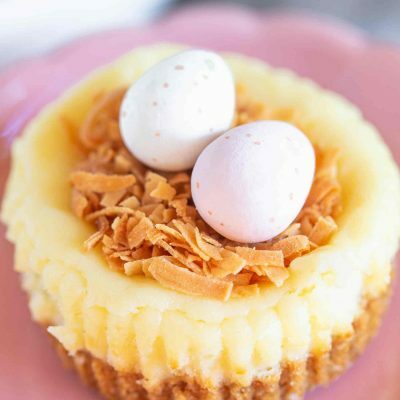 It gives me two days to celebrate and an extra excuse to have friends over for some finger food and munchies! My favorite enchilada sauce to use is medium red enchilada sauce because it’s not too spicy and it’s not too mild. 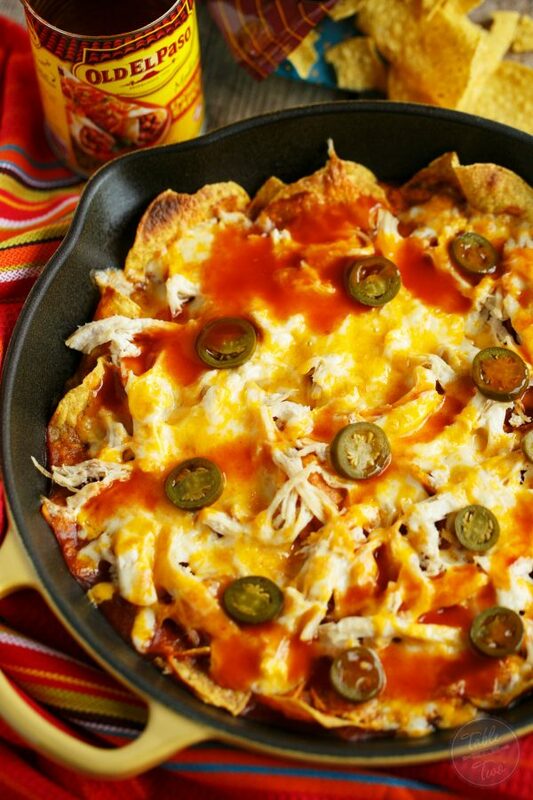 It’s perfect for these cheesy enchilada chicken chilaquiles! Fun fact about chilaquiles: I finally learned how to say it correctly when I was in San Diego and my friend Kristen and I went to brunch together. It was slightly embarrassing the way I said it prior to knowing how to pronouncing it correctly. 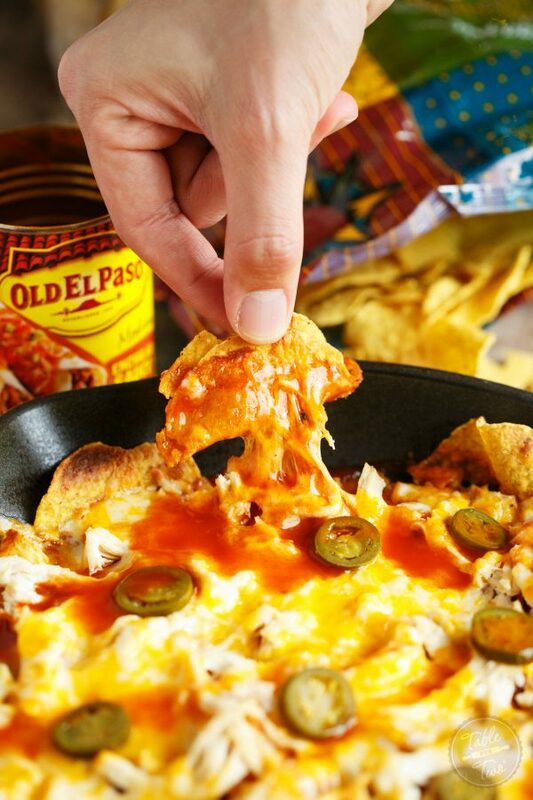 Cheesy, easy, spicy, and perfect for the big game! NEVER MISS A RECIPE!Sign up for email updates! 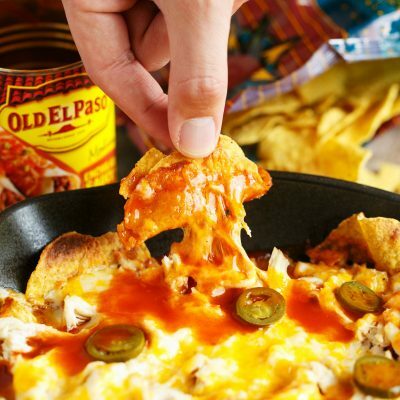 In a 9-inch cast iron skillet, or similar, add tortilla chips. It doesn't have to be perfect, they can be stacked and scattered. Pour enchilada sauce on top. Place over medium-high heat and carefully watch the skillet until mixture comes to a simmer. Reduce heat and then let mixture simmer until tortilla chips have softened, about 7-10 minutes. Turn on the boiler in your oven. 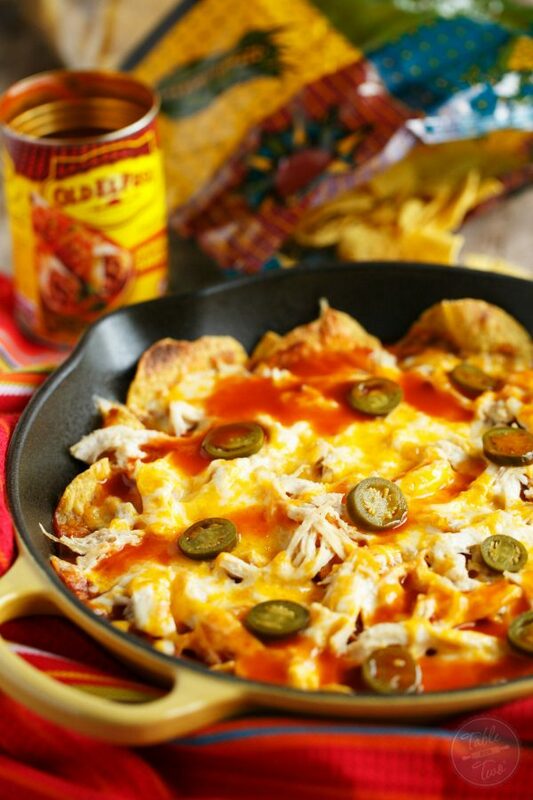 Add shredded chicken to the top of the tortilla chips then sprinkle cheese all over. Place under boiler for 5 minutes, or until cheese is completely melted. Watch this carefully as the tortilla chips could char and burn. Top with jalapeño slices, if using. Feel free to top this dish with whatever else you love, such as: sour cream, green onions, etc. We need to have a big ole enchilada party! This looks So good! One of my favorite dishes EVER!!! 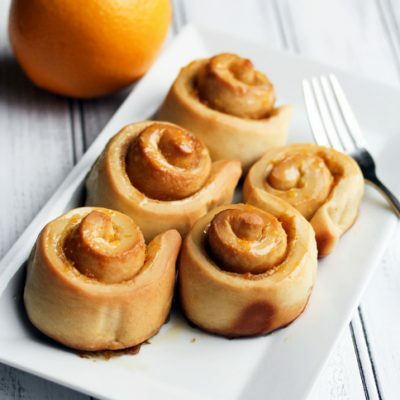 I need to make these for the Super Bowl! Happy Belated and these look awesome!! 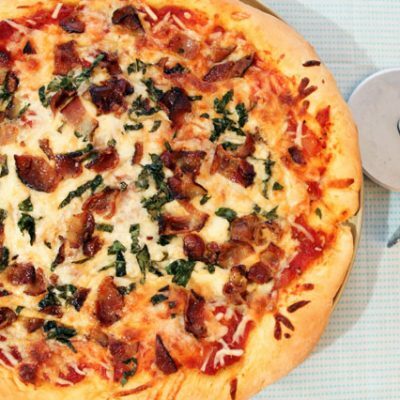 You really can’t go wrong with all that cheesy goodness! Yum!